Parkinson's disease (PD) results in progressive disability despite the availability of many medical and surgical treatments. Patients with PD initially reported of difficulty in walking followed by problems with some gait dependent activities including house works, dressing, transferring in and out of bed and mobility inside the home and community. Although underlying pathophysiology of postural instability remain elusive, it is one of the most debilitating motor symptoms of PD, as it is associated with an increased risk of falls and subsequent medical complications (e.g., fractures), fear of falling (FOF), decreased mobility, self-restricted physical activity, increased dependency, social isolation, and decreased quality of life (QOL). Dual-task (DT) performance involves the execution of two tasks (primary and secondary) at the same time. Most of the daily living activities (ADL) requires DT performance to efficiently accomplish different tasks in everyday life like shifting objects from one place to other, monitoring the environment and judging the threats and balancing effect to transfer self, etc. Due to disruption of the motor function of basal ganglia, patients with PD, demonstrate noticeable problems while performing DT with a significant amount of gait and balance impairments which are also known as fall risk factors., People with PD compensate for some of their locomotor disturbances due to nonspecific interference with attentional mechanism while performing either motor or cognitive secondary task. Almost two-third of patients with PD fall each year, with most falls reported to occur while walking. Falls and FOF share common predictors and individuals who develop one of these are at risk for developing the other, with a resulting spiraling risk of falls, FOF, and functional decline. A short-term study done on DT training was found to be effective in balance and ADL improvement in patients with Parkinsonism. A 4 weeks DT training program resulted in functional walking capacity in idiopathic PD. There is a growing body of literature in support of feasibility and clinical implementation of DT training to address different gait disturbances in people with PD. With progressive symptoms, it is yet to clear that whether these kind of training programs has long-term benefits in people with PD. In the present study, we aimed to examine the long-term effect of a DT training program applied with basic principles of motor learning on falling and ADL in patients with PD. Fifty-four patients diagnosed with idiopathic PD were enrolled in the study from the Department of Occupational Therapy of a tertiary rehabilitation care unit. After obtainment of written informed consent, patients were divided into two groups (27 each), i.e., Group A (Experimental) and Group B (Control) by simple randomization into this single-blinded study. Demographic characteristics of the samples are presented in [Table 1] in illustration. Patients allocated to the Experimental Group received 12 supervised training sessions (three times a week for 4 weeks). The training targeted performing DT, i.e., walking with some secondary tasks and aimed to be intensive and progressive. All the patients in both groups received conventional occupational therapy and patients in the control group received conventional occupational therapy matched for time, sessions, and weeks with the experimental group. The conventional occupational therapy included working on activities of daily living skills, hand functions, rhythmic stabilization, bilateral activities, balance and coordination training activities, etc. The study was conducted in adherence to the principles of the declaration of Helsinki. Inclusion criteria comprised diagnosis of idiopathic PD, Hoehn, and Yahr stages II to III and with stable antiparkinsonian medication, able to walk unassisted at least for 5 min and have a history of fall in last 6 months before inclusion. Exclusion criteria encompassed dementia or any other cognitive impairment (Mini-Mental Status Examination <25), coexisting serious chronic medical illnesses (e.g., orthopedic, psychiatric, or neurological) or severe visual deficits preventing participation. Outcome variables included the Tinetti Fall Efficacy Scale for FOF and functional independence measure (FIM) for functional performance., All the assessments were done while patients were in the medication-on-state at baseline (pretest) and immediately after the termination of the training program (posttest) (week 4). Follow-up scores were recorded for both outcomes in every 6 months interval following posttraining program for 2 years. A number of falls within 6 months period were recorded by taking the history of fall from caregivers/patients at baseline (BF) and every 6 months interval after completion of training program for 2 years. The training targeted both walking and secondary tasks and aimed to be intensive and progressive. In each training session, patients completed five blocks of 5 min of walking (i.e., a total of 25 min of walking in each training session) and 1 min of rest break in between blocks of 5 min walking. In each 5-minute block, patients performed different kinds of secondary tasks: Serial subtractions, and coin transfer. The therapist had to safeguard the patient and provides appropriate feedback (knowledge of result and knowledge of performance) during the DT training. No explicit instruction for prioritization of either task was given and was completely determined by therapist. The order of the DT conditions was randomly assigned. Progression during the training was done by (a) Shortening of break times from 4 min (1 min each between blocks) (1st week) to 2 min (2nd week), to 1 min (3rd week), to no breaks (4th week), and (b) Adding obstacles from 2nd week: 3 boxes were placed with equal separation on the walkway and gradually the numbers of obstacles were increased to 4 and finally 5 in the 3rd and 4th week of training. Patients were asked to walk over the obstacles without touching them. During training, in first walking condition, patients were instructed to walk at their preferred pace on level ground in a well-lit, obstacle-free, 30-m long corridors for 5 min and were allowed to become familiar with the walkway. Serial subtractions walking condition included patients walking while performing serial 3 subtractions out loud, starting from a three-digit number (e.g., 497). In coin transfer, a commercially available waist bag was tied at the waist with midpoints of the pocket aligning over the anterolateral aspect of the hip joint of the nondominant side. A total of 25 Indian 1-rupee coins was placed in the pocket of the trouser/kurti on the side of their dominant hand. 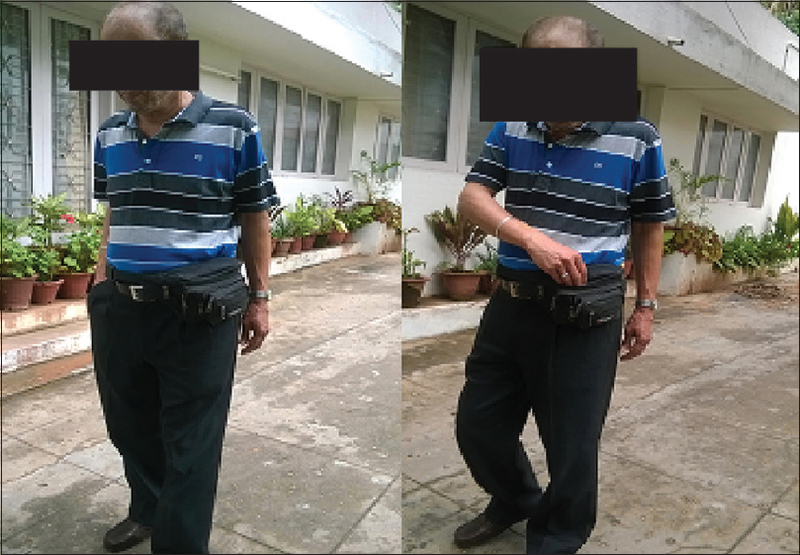 Patients were then instructed to use their dominant hand to transfer as many coins as they could, one at a time, from the starting pocket to the pocket of the waist bag present over the opposite side hip joint [Figure 1]. Patients reported their dominant hand by indicating which hand they would use to catch a small ball. The α level was set at 0.05, and outcome analyses were conducted using SPSS software version 23.0 Developer: IBM Corp. India License: Trialware or SaaS). A total of 89% of patients (Group A 23 and Group B 25) attended at least 2 of the follow-up assessments out of 4 and 81% of patients reported for the final follow-up assessment 2 years posttraining program. As the number of patients reported in each follow-up assessment varied [Figure 2], pre- and post-training program and final follow-up scores were analyzed for convenience and to maintain the integrity. For FIM and Tinetti fall efficacy scale, the Friedman test was used to know the difference within the group. If the comparison revealed significant difference Wilcoxon signed-rank test was carried out. Moreover to know the difference between the groups Kruskal–Wallis test was carried out followed by Mann–Whitney U test. For analysis of some falls, scores recorded at baseline (BF) and after 2 years posttraining program (FF) was considered. Within the group analysis was performed by Paired t-test and for between the group analysis, independent t-test was carried out. Descriptive characteristics of all outcomes for both the groups is shown in [Figure 3] in illustration. Friedman test was carried out for within the group analysis. It showed a significant difference (P = 0.000) for both the groups and both outcome measures. Wilcoxon signed rank test was carried out for both the groups and for both the outcome measures and the result is shown in [Table 2] in illustration. Kruskal–Wallis test was carried out for between the group's comparison for both the outcome measures and it showed a statistically significant difference (P = 0.000). Mann–Whitney U-test was carried out for both outcome measures post-Kruskal–Wallis test and result is shown in [Table 3] in illustration. Within the group analysis by paired “t”-test showed the number of falls reduced significantly (P= 0.000; confidence interval [CI] for Group A: 2.256–3.173 and Group B: 1.043–2.657) for both the groups. The experimental group showed a significant reduction in a number of falls (P = 0.031, CI: − 1.802–0.012) as compared to the control group as measured by independent t-test. Seven patients from the experimental group reported “no” falls in the last 6 months during final follow-up, whereas only 1 patient reported to have no fall from the control group during the same assessment. The present study assessed the outcomes of a DT intervention on falls and ADLs over a period for 2 years in patients with PD. Although being a progressive disease patient with PD in both groups managed to overcome the FOF, thus resulting in significant decrease in a number of falls and increased independency in performing functional tasks over a period of 2 years. However, patients with PD undertaken DT training program showed a statistically significant difference in the improvement in the above outcomes and the effects were maintained as long as for 2 years. This study moved beyond the previous works by implementing both cognitive and motor DT training and demonstrating its positive effect on falls and functional performance with its retention effect for 2 years. As the basal ganglia play a major role in the control of learned, repetitive movement sequences through their outputs to the supplementary motor area and brain-stem locomotor regions, DT interference is a particularly noticeable problem because of the disruption of the motor functions of the basal ganglia in people with PD. In the early stages of motor skill acquisition, the cortical regions of the brain are believed to play a major role in movement regulation. As movements become learned and automatic, they are thought to be controlled by the basal ganglia. When a movement is controlled by the basal ganglia, a person, in theory, can direct attention to control more novel or attention-demanding tasks through the use of the frontal cortical regions. In people with PD, normal movement patterns can be generated when attention is focused on performance; attention is thought to lead to a bypassing of the basal ganglia and the use of cortical regions to drive outputs. In DT situations, cortical resources may be engaged in maintaining the performance of the secondary task, leaving responsibility for regulating the performance of the more automatic task to the defective basal ganglia circuitry. Findings of our study are consistent with previous studies of rehabilitation. The possibility of DT training (where both tasks are not walking) has been examined in several other studies where DT training is found to have positive effects on balance confidence, gait parameters, ADLs leading to increased QOL.,,, This would have resulted in a significant reduction in a number of fall and FOF. DT training when applied as “whole task” with principles of motor learning, improvement in DT performance was observed, and even the transfer of learning was reflected in nontrained DT performance., This would have been one of the possible causes of improvements in ADL performance in patients with PD in this study. In addition, the training program implemented here was based on principles of motor learning. The tasks designed with the specific aim of improving DT function. Since practicing DT involves implicit processes, feedback of knowledge of results was provided for both tasks (primary and secondary) practiced. Variability in practice was maintained by using different cognitive and motor tasks in the training program with no specific order and to promote progression and enhance motivation, level of difficulty was maintained by adding obstacles into the walking path and decreasing the duration of rest breaks. The result of the study showed statistically significant improvements in falling and ADL performance, and the improvements were carried out till 2 years posttraining program suggests the feasibility and efficacy level of clinically implemented DT training program in patients with PD. As it was a single-blinded study design, rater bias might have had some impact on the result of the study. From the perspective of a patient targeted program, it might be helpful to create a “pool” of secondary tasks (motor and cognitive), ordered in increasing level of difficulty, that could be adjusted to each patient's abilities and could enable progression during the training program. Patients with PD have difficulty performing several tasks due to an increased risk of fall, subsequently leading to decreased mobility, increased dependency and decreased QOL. The result of the study showed the feasibility of a clinically implemented DT training program to reduce falling and FOF thus resulting in improvement of functional independence with its strong retention effect. Comparison of motor DT and cognitive DT with their retention effect can be carried out. I express my sincere thanks to the Medical Director, Plexus Neuro and Stem Cell Research Centre, Dr. Naeem Sadiq for his guidance, support and encouragements. I also wish to thank all the participants of this study for their cooperation and making this study possible. Shulman LM, Gruber-Baldini AL, Anderson KE, Vaughan CG, Reich SG, Fishman PS, et al. The evolution of disability in Parkinson disease. Mov Disord 2008;23:790-6. Jacob JC, Joseph RP, Marjan J, Ahmed AM. Postural instability and falls in Parkinson's disease. Rev Neurosci 2016;27:549-50. O'Shea S, Morris ME, Iansek R. Dual task interference during gait in people with Parkinson disease: Effects of motor versus cognitive secondary tasks. Phys Ther 2002;82:888-97. Brauer SG, Woollacott MH, Lamont R, Clewett S, O'Sullivan J, Silburn P, et al. Single and dual task gait training in people with Parkinson's disease: A protocol for a randomised controlled trial. BMC Neurol 2011;11:90. Friedman SM, Munoz B, West SK, Rubin GS, Fried LP. Falls and fear of falling: Which comes first? A longitudinal prediction model suggests strategies for primary and secondary prevention. J Am Geriatr Soc 2002;50:1329-35. Sethi V, Ravi R. Effects of dual task training on balance and activities of daily livings (ADLs) in patients with Parkinsonism. Int J Biol Med Res 2012;3:1359-64. Pandian Sankara KP, Tamilvanan M, Diwakar KP. Efficacy of dual task training to improve functional gait performance in idiopathic Parkinson's disease subjects. Int J Sci Res 2013;2:339-42. Goetz CG, Poewe W, Rascol O, Sampaio C, Stebbins GT, Counsell C, et al. Movement Disorder Society Task Force report on the Hoehn and Yahr staging scale: Status and recommendations. Mov Disord 2004;19:1020-8. Tinetti ME, Richman D, Powell L. Falls efficacy as a measure of fear of falling. J Gerontol 1990;45:P239-43. Dodds TA, Martin DP, Stolov WC, Deyo RA. A validation of the functional independence measurement and its performance among rehabilitation inpatients. Arch Phys Med Rehabil 1993;74:531-6. Sahu S, Srivastava A. 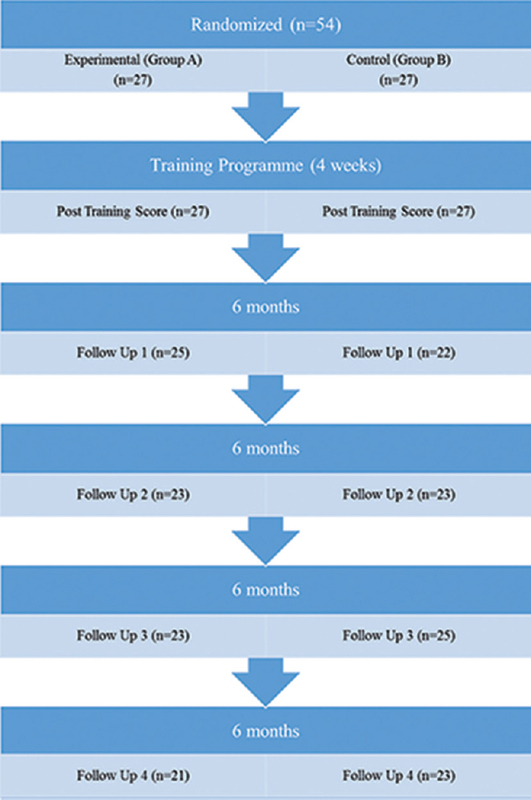 Effect of dual task training program on quality of life in patients with Parkinson's disease. Indian J Occup Ther 2016;48:37-41. Yogev-Seligmann G, Giladi N, Brozgol M, Hausdorff JM. A training program to improve gait while dual tasking in patients with Parkinson's disease: A pilot study. Arch Phys Med Rehabil 2012;93:176-81. Kramer AF, Larish JL. Aging and dual task performance. In: Rogers WA, Fisk AD, Walker N, editors. Aging and Skilled Performance. Mahwah: Lawrence Erlbaum Associates; 1996. p. 83-112. Erickson KI, Colcombe SJ, Wadhwa R, Bherer L, Peterson MS, Scalf PE, et al. Training-induced plasticity in older adults: Effects of training on hemispheric asymmetry. Neurobiol Aging 2007;28:272-83.